Today I had the occasion to re-read part of Guy Steele's classic speech, Growing a Language, which uses only words of one syllable or words defined previously in the text. 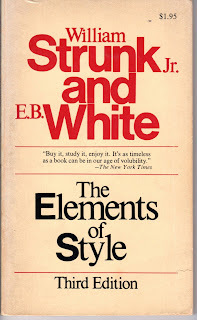 I thought the end of his talk worth quoting here, in part because it has something to say about Strunk and White, of which I have recently spoken and blogged. If you've not heard or read the talk previously, I urge you to follow the video or text link above and enjoy it in its entirety. One of the good things I can say for short words is that they make for short talks. With long words, this talk would run an hour and a half; but I have used less than an hour. Thus I think that programming languages need to be more like the languages we speak— but it might be good, too, if we were to use the languages we speak more in the way that we now use programming languages. All in all, I think it might be a good thing if those who rule our lives—those in high places who do the work of state, those who judge what we do, and most of all those who make the laws—were made to deﬁne their terms and to say all else that they say in words of one syllable. For I have found that this mode of speech makes it hard to hedge. It takes work, and great care, and some skill, to ﬁnd just the right way to say what you want to say, but in the end you seem to have no choice but to talk straight. If you do not veer wide of the truth, you are forced to hit it dead on. I think it is sad that linguists like Geoffery Pullum end up being dismissed so readily. 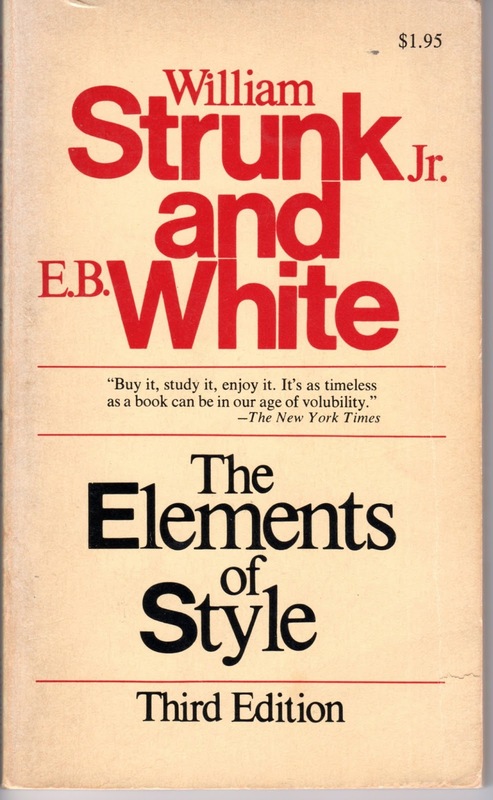 Here is someone who has dedicated his life to the scientific study of language and when he and other linguists try to inform the public that Struck and White were not good English grammarians, it falls on deaf ears. Do people have the same attitude about the debunking of math crackpottery on Good Math Bad Math? (http://scientopia.org/blogs/goodmath/) Why is the informed opinion of this scholar just thrown out so easily? Due to the FAITH that people put in the opinions of authors like Struck and White, generations of students suffer under red ink and insults as they try to communicate in perfectly valid English. What was the evidence that those authors offered for their opinions? They were essentially folk remedies. Maybe in folklore we find some ok advise, like 'eat an apple' but hiding down that same rabbit hole of irrationality we find phlebotomy and worse. If people are so interested in the beauty of English and human language, why don't they actually pick up an introductory linguistics text book or read some of a real English grammar? There are also style guides written by more knowledgeable people. Additionally, this idea of inconsistency in language, in my opinion seems to be very badly understood. There is a lot to be said as far as pointing out how apparent inconsistencies in grammar actually follow very consistent rules. Leaving that aside, as people grapple with the CAP theorem and work on such things as inconsistency robustness in distributed systems, shouldn't people be looking at how human language and cognition have dealt with these problems? Isn't it possible that these inconsistencies are a property of nature and that language is simply a wonderful adaptation that provides a flexible means for dealing with it? I get surprised sometimes but I do not crash due to unexpected and contradictory messages. In other words, we might find inspiration by looking at REAL language. Also, that short word thing doesn't make sense. Especially when you think of compounds. Why is 'mailman' worse than 'man who brings the mail'. 'Mailman' is longer but it is also very clear. Also, this is really anglocentric. Some languages form very 'long' words and would have to go through all sorts of acrobatics to avoid it. Isn't the idea that we want transparent compositionality in effective communication?